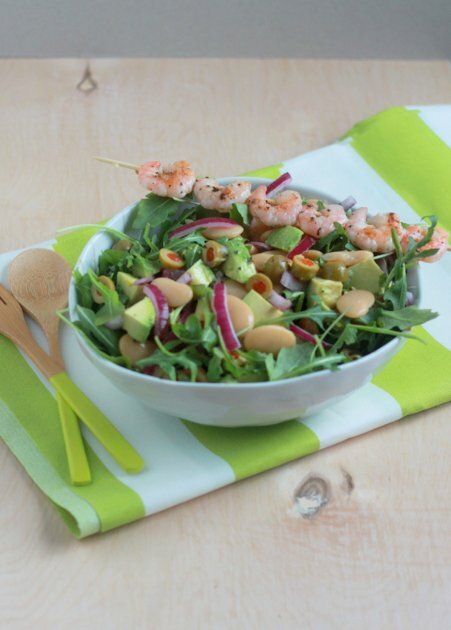 Peppery arugula cradles creamy butter beans, fresh avocado, red onions, and salty green olives. A vivacious lemony vinaigrette pulls it all together. 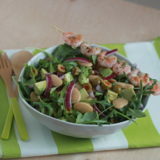 Optional grilled shrimp satisfies the seafood-eaters of the family, but this salad is also plenty hearty without them. Though we’re huge fans of the salad I’m sharing with you today (mine without shrimp, his with), overall, we’re not much for seafood in our family. My guy just generally doesn’t love it, and for me, fish and its brethren went out the door many years ago when I became a vegetarian. Although … I did make a run at pescetarianism for about a week after I decided to drop meat. At the time, I thought I might keep fish in the picture – but not for the health benefits. Oh no. It was because I couldn’t imagine a world without McDonald’s Filet-o-Fish. Ultimately, I gave up seafood altogether, and my guy only occasionally partakes in fish ‘n’ chips or, yes, shrimp – usually of the bacon-wrapped appetizer variety. But as it turns out, shrimp of the lightly seasoned and grilled variety is also a fabulous accompaniment to this salad – if you so choose. It works perfectly either way. I adore the combination of flavors and textures in this salad. Mildly peppery baby arugula cradles creamy butter beans and avocado; the addition of classic Spanish green olives gives each bite a perfect amount of salt and brine. The bright, bold vinaigrette – made lemony with both zest and juice – makes it all sing. Those huge, hearty butter beans help make this salad plenty satisfying, so shrimp-less diners should leave the table more than happy. I like to think of the shrimp as a just nice little something extra for those who like ’em. 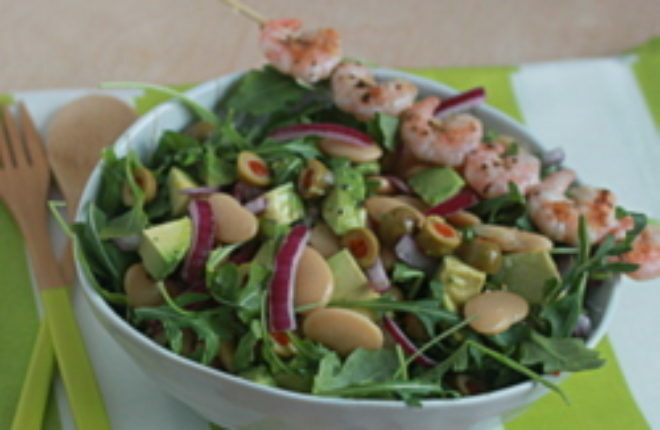 Place the arugula in a large salad bowl, and scatter butter beans, red onion slices, green olives, and avocado on top. Zest the lemon and add 1 teaspoon of zest to a small bowl. Squeeze the lemon and add 1/4 cup of the juice to the bowl. Add the olive oil, honey, salt, and pepper. Whisk until blended. Pour dressing over the salad and toss right before serving. Poke a bamboo skewer through both the body and tail of the shrimp and place on a plate. Drizzle with olive oil and lemon juice and sprinkle lightly with salt and pepper. Turn over and repeat with the other side. Heat a grill or grill pan over medium-high heat. Cook the shrimp one to two minutes on each side, until pink and done. 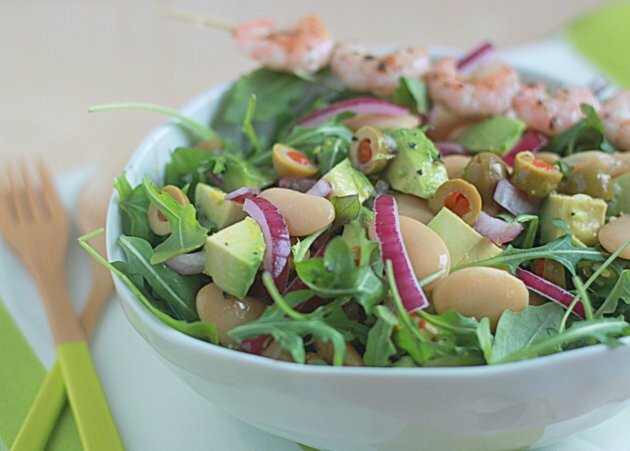 Top individual servings of salad with shrimp skewers, as desired. I can help you forget about a world with McDonald’s Filet-o-fish. Many years ago before I became a vegetarian I worked at McDonald’s. On our breaks we’d get a free burger, small fries, drink, and dessert. One of the persk back then – free junk food. A friend of ours has a son who works there and they don’t get free meals on their breaks anymore. I’d usually take the filet-o-fish. One day I’m in the break room and I took a bite of the filet-o-fish. Normally I’d keep biting and wolf that thing down but this day I happened to put the burger down and something caught my eye that was in the fish. I pulled it out and unrolled it and it was a worm. Like a regular worm you see in the garden, about 3″ long. That was really gross and if I’d taken one more bite I’d have swallowed it. I’m not blaming McDonald’s. I’m sure that fish already had the worm in it before it was filleted rather than someone in their food warehouse jammed in there. Anyway that did me in and I never touched another filet-o-fish. As for your recipe I’d never heard of butter beans so I looked them up and lima beans are the same thing. Olives! One of my favorite ingredients. And they go so well with lemon. I really never liked fish, so it wasn’t an issue for me to give them up. I did eat shrimp for a while when I was a kid, but then I became convinced that after I ate them, they would somehow reanimate and swim around in my stomach. Have you seen that they sell imitation shrimp now?! Oh, so scary! Is this the most rambling comment ever? Perhaps! Beautiful salad. I love the addition of the butter beans. Yum! BTW I used to love the mcDonalds filet-o-fish too. Now it scares me!